I really wanted to try my hand at making up my own recipe and I had a few items in the pantry that I thought would work well together. I don't often toot my own horn but these are some of the best cookies I've ever made. My husband told me they might even be better than Chocolate Chip and that's really saying something! 1/4 cup cookie butter (I used this smooth cookie butter I bought on Amazon). First I assembled most of the ingredients together. In a medium bowl I mixed together the graham cracker crumbs, flour, baking soda and salt. Then I set it aside. In the bowl of my stand mixer I mixed together the softened butter with the cookie butter and both sugars. I added the eggs in one at a time beating well after each addition. Lastly I added in the vanilla. Slowly I added the flour mixture to the stand mixer; stopping occasionally to scrape down the sides of the bowl. Once my batter was completely combined, I dumped in the entire bag of Heath pieces. I used my spatula to mix all the bits into the batter and prepared my cookie sheets with parchment paper. Using my cookie scoop I put 12 cookie balls on each sheet and baked them in a pre-heated 350 degree oven for 9-11 minutes or until the edges were a light golden brown. I let them cool on the sheet for two minutes before removing. I know they don't look like much but if you flip them over you can see all those crunchy bits of heath. These cookies had an amazing texture and the taste of the heath, graham and cookie butter combined was just sinfully good! Oh my, these look so delicious! 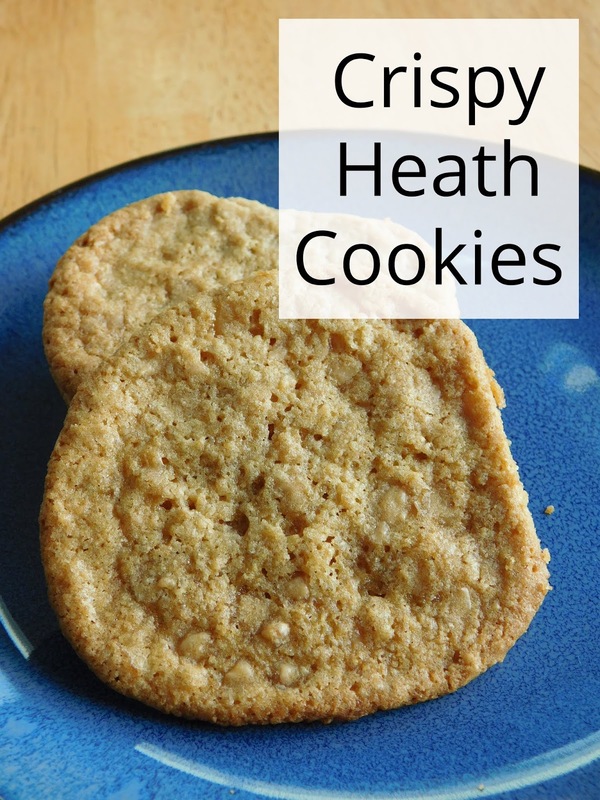 I love Heath bars, so I'm sure I'd love these cookies. I love Heath bars too. I just can not express how good these were!! I did think that might get confusing... but they are soo good; even if they aren't healthy! Ha. They look so good! Thank you for sharing the recipe at The Really Crafty Link Party. Pinned! Thanks so much for hosting and for the pin! I haven't had much luck with cookie scoops, what kind and size do you like? These are right on the mark, how did you come up with it, just open up the cupboard? I wonder if the graham crackers make it so light and crispy? Good for you for showing the perfectly browned bottom, a pet peeve of mine is the lightly baked bottom and you see it everywhere. I can't wait to try these and I know I've got an unused bag of Heath pieces buried somewhere. They look incredible. We bought a set of scoops from Pampered Chef; and I like their small scoop for cookies. I had a similar cookie I made years ago with graham cracker so I pulled most of the recipe from that but added the cookie butter and Heath pieces. I just love cookies too! Your Heath Cookies look fantastic! Hope you are having a great week and thanks so much for sharing your awesome recipe with us at Full Plate Thursday!